Back on June 21, economist Austan Goolsbee wrote a column for the New York Times (subscription only) discussing recent research on international productivity differences by London School of Economics economist John Van Reenen and colleagues. Goolsbee's discussion of Van Reenen's new paper was sensible, but Goolsbee made a rookie mistake in an effort to dump on the French economy. According to Goolsbee: "For all the collective hand-wringing, the United States is still home to the most productive workers of all the major economies -- more than Japan, more than China, more than Germany, Britain, France or most any other nation on earth." Goolsbee even ends his piece with a gratuitous attack on the French: "Perhaps the lesson from the research can be boiled down to something most Americans clearly understand: The world economy may be tough on your industry but look on the bright side: you could be French." The problem is, however, that according to every major piece of research that has looked at the question, French workers are actually more productive than US workers. The graph below, for example, shows hourly labor productivity estimates for 2006 from the Groningen Growth and Development Centre (GGDC) in the Netherlands. In the graph, the value of the average output per hour of the workers (labor productivity) in each country is expressed relative to the US level in 2006 (set equal to 100.0). By this measure, the average French worker was at 105, about five percent more productive than the average US worker. Dutch (102), Irish (105), Belgian (105), and Norwegian (124) workers were also more productive than US workers. German workers --at about 92 percent the level of US workers-- would almost certainly have been more productive than US workers if not for the effects of German unification back in 1991, which added a large share (about 20 percent of the total population) of typically low-productivity east German workers to the national workforce. 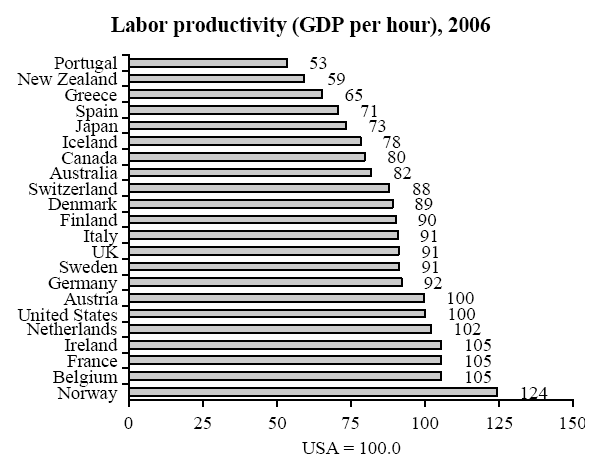 The GGDC data are not at all controversial and are completely consistent with other recent research by the Organization for Economic Cooperation and Development (here [.xls spreadsheet], which shows average productivity about one percent higher in France than it was in the United States in 2005) and the Bureau of Labor Statistics (here [PDF], see Chart 4, which shows France about 1.6 percent ahead of the United States in 2006).